Boss Agriculture ’ DX50 double disc planters are robust parallelogram twin disc openers which deliver optimum seed placement. 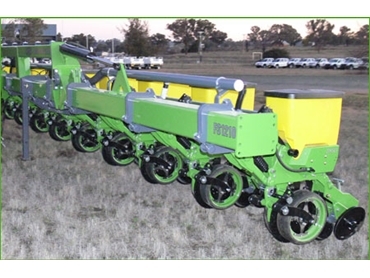 These disc planters have been primarily developed for minimum or no-till broadacre farming applications where tough, simple, highly accurate planters are required. The double disc units offer superior seed placement, excellent ground following ability and minimal ground disturbance/moisture loss. The parallelogram clamps to an RHS toolbar in the diamond position to ensure the units lock in and are not able to twist on the toolbar. The parallelogram features a simple, easy to use pin arrangement for adjusting the down force, all parallelogram pivots are fitted with replaceable bushes and chrome plated pins for reliable and smooth operation. Each unit can be individually pinned up when operating on wide or skip row spacings. These double disc planters have optional solid fertiliser and/or liquid fertiliser tubes which are easy to access and adjust without interfering with seed placement. Press wheels are 1½” x 12” heavy duty running on tapered roller bearings with easy T-handle pressure adjustment and can be run offset or opposing depending on ground conditions. Press wheel pressure is adjustable up to 70kg for the most testing conditions. The DX50 double disc openers have trailing gauge wheel arms which pivot on an extra wide 120mm bushing ensuring durability in the toughest broadacre conditions. Gauge wheels are a spoke design which in sticky conditions allows mud shed off the disc by the tungsten blades to flow out through the spoked gauge wheel. Twin 16” discs are mounted on durable tapered roller bearings with triple lip seals. Discs operate at opposing 4 degrees for a narrow seed trench which reduces down force requirements and creates a smaller “Vee” to close.